Thai Basil Chicken is one of my favorite Thai dishes… however, this is not a recipe for that. My Asian stir-fry and chili consumption had been a bit excessive of late and I was looking to cook something a bit blander and healthier. I decided to go more towards the American-Italian grilled chicken pesto dishes but with an Asian-inspired pesto sauce, and sans the pasta and cheese. I had accidentally bought a bunch of Thai basil on my last market trip, and as a result I ended up making a fresh batch of Thai Basil Pesto. 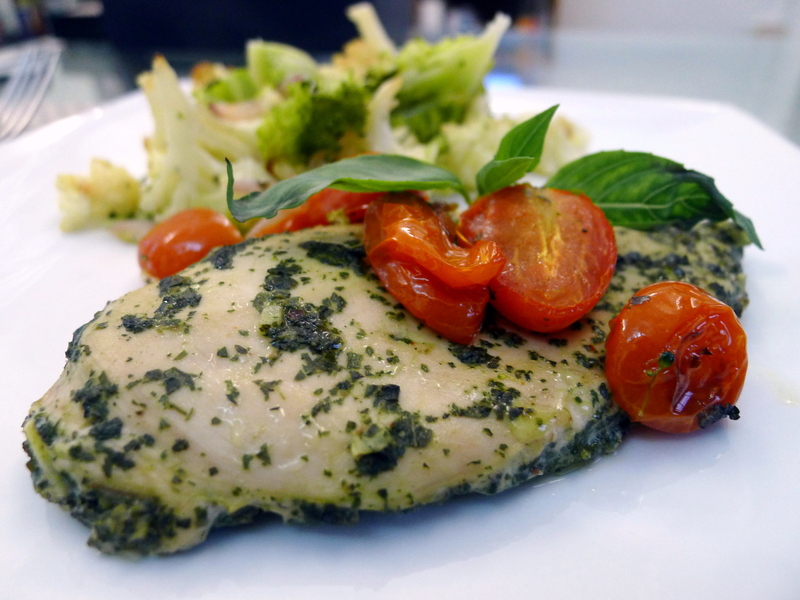 I decided to use the pesto as an easy marinade for some chicken breasts, which I baked in the oven and then served with some roasted tomatoes and cauliflower for a simple and healthy dinner. Directions: Preheat oven to 350°F. 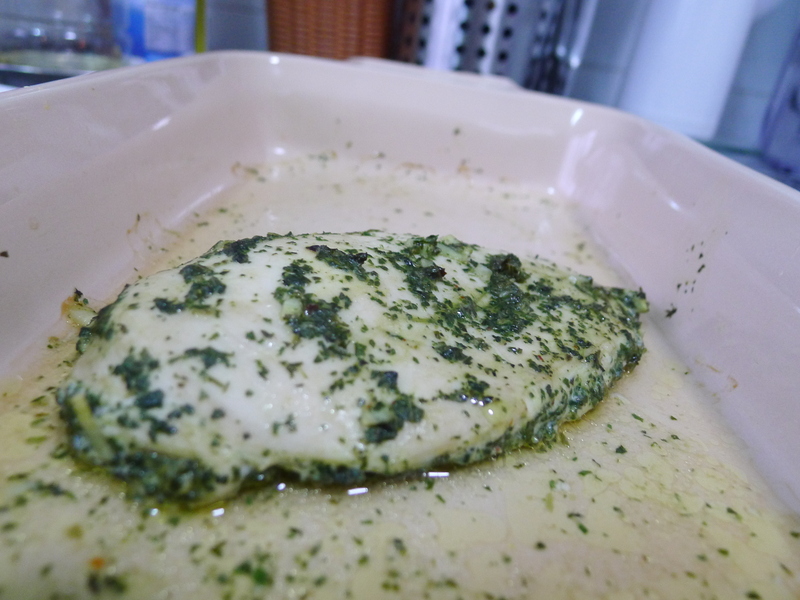 In a shallow baking dish, rub the pesto and garlic over the chicken breasts. Cover and let sit in the refrigerator for 10-15 minutes. 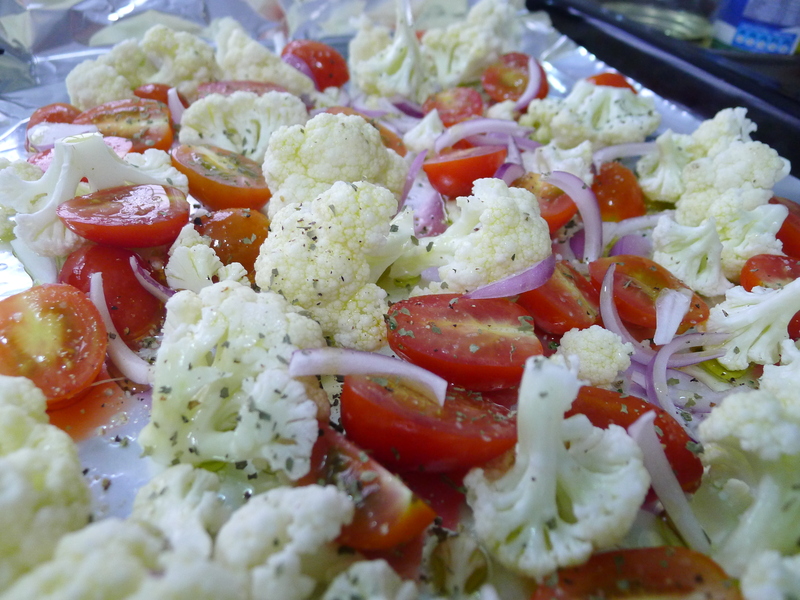 Line a baking sheet with aluminum foil and scatter the halved cherry tomatoes, red onion slices and cauliflower florets into a single layer onto the pan. Drizzle generously with extra virgin olive oil, and season with salt and pepper. The vegetables will take a bit longer to roast than the chicken if you are using the same 350°F oven simultaneously, so start cooking them first. Cook the vegetables for about 45 minutes or until tender. Or if you have a second oven, turn that one to 425°F and the vegetables will only take about 20 minutes. 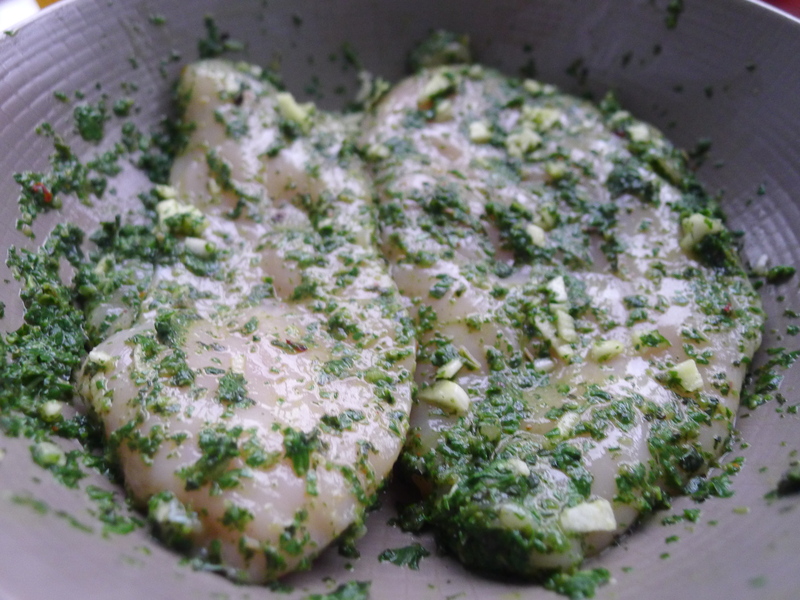 Back to the chicken — shake the chicken to remove any excess pesto. Place in the oven and cook for 30 minutes or until the chicken is no longer pink. Serve with the roasted tomatoes and cauliflower and enjoy!